Hometown attorney. Local resident since 1955. Aggressive, hardworking and affordable with a winning record. Looking forward to fighting hard for your family. Serving the Puyallup Washington region and surrounding areas. 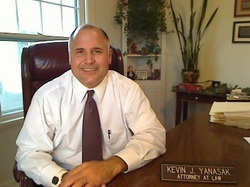 Kevin J. Yanasak has been a trial lawyer in Washington State since 1985. He represents clients throughout Washington, including municipal, district, superior, appellate, federal, tribal, and the circuit court of Oregon. Kevin practices (bench & jury trials) in the areas of personal injury, criminal (traffic, misdemeanor, DUI, felonies - adult & juvenile), family law (complex dissolution proceedings - past GAL / parenting investigator), probate & estate planning and civil lawsuits. He believes the highest compliment his clients can give him is to refer their family and friends. Kevin graduated from Gonzaga Law School, where he was selected to be on Law Review. He clerked at the Spokane City Attorneys office (defended city in negligence trial). He is a past deputy prosecuting attorney for Pierce County (handled thousands of cases, and trials), and served as a pro-tem judge in Eatonville Municipal Court. Prior to law school, Kevin grew up and worked on a 40 acre farm, in Orting, WA. He also picked berries 3 summers (starting at age 9). Worked chicken farm, milked cows, daffodil bulbs & corn fields, produce farms, hay fields, collected tree cones, Christmas boughs, grocery store & gas station. He spent 6 summers logging near Mt. Rainier & S.E. Alaska, 3 more summers on seafood barges in Alaska (crab & salmon in Bering Sea - Aleutian Islands to Nome). Thinned apples alongside migrant workers in Wenatchee. Fought forest fires, commercial painter, hod carrier & Laborers Union in Spokane. While in high school, he backpacked 2 1/2 months Europe & North Africa; official Taps bugler Soldiers Home. Paid own way through college & law school. Also traveled throughout United States, Canada, Mexico, Brazil, South Africa, West Indies & South Pacific (hitch-hiked across USA). 1/2 subject 1957 world wide news "twins lost in woods". Provided legal services to Tacoma's low-income Hilltop area. Kevin was a 4-year varsity letter winner at WSU, where he was captain of the wrestling team. He received an NCAA Division 1 scholarship, graduated with two degrees, and was awarded the Pacific-10 Conference Medal (1979 outstanding student-athlete award). At Orting High School, Kevin was a 4-year varsity letter winner in football and wrestling, and was the student body president - 1st NCAA Division 1 wrestler from the town of Orting. After college, he coached in Spokane and in 1990, was named head wrestling coach at Orting high school. He also did internships at Spokane City Hall, and in Washington, D.C.
Kevin is involved in the community, and was chair of the Edgewood Planning Commission. He enjoys reading, traveling, splitting wood, mushroom picking, crabbing - Shaw Island property, gardening (featured in Puyallup Herald, 5/08), mountain climbing (solo Mt. Rainier '94; summited 10 times), running (8 Marathons 2015-16, age 59-60), reading the paper & watching the news shows on Sunday morning.